Product development process is not simple. Starting from identifying the need in the market, product development process begins and continues with ideation, validation, prototyping and eventually, mass production. However, sooner or later, you will validate some of your ideas on your audience, and built a product prototype according to consumer feedback. Now, the next step is mass production — but before proceeding to that, just like every other feedback loop, you need to make your audience consume/use your prototype, collect feedback from them, and iterate your prototype to find out mistakes you have made before those mistakes grow exponentially. No worries. We have powerful tools at our fingertips thanks to market research. Thanks to the market research methodologies, product development cycle can be managed and observed to build a successful product. Usage and attitude research, concept testing and product testing studies allow us to validate all our ideas during the process and minimize the risks when developing a product. Hence, it will enable us to build consumer-oriented products — which is the key to product success. 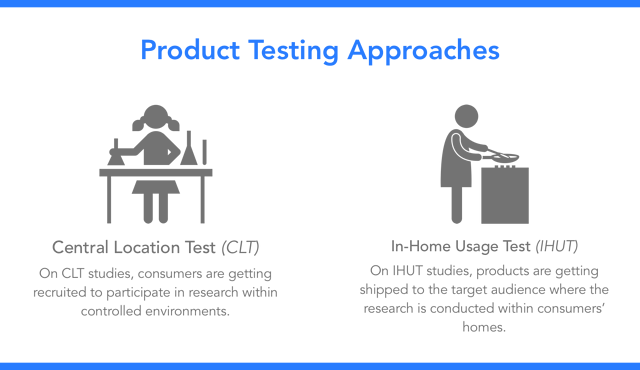 Product testing is a research methodology allowing businesses to collect qualitative and quantitative information about consumer’s potential consumption/usage behavior, preferences, and reactions on a product. Your product may be a software product or a consumer non-durable; it does not matter. You make your audience use or consume your products, and collect their reactions on product usage, the taste or smell, etc. There are two types of product testing; IHUT and CLT. Even though the methodologies and research are similar, there are small differences. On IHUT studies, products are getting shipped to the target audience where the research is conducted within consumers’ homes. Consumers prepare and consume the product within their homes and share their experiences during and after the experimentation. IHUTs are getting conducted via mobile/online market research platforms, companies. On CLT studies, consumers are getting recruited to participate in research within controlled environments. These controlled environments can be a mall or a laboratory, where consumers come to these places to consume a product or use it, then share their experiences. CLTs are getting conducted via traditional market research companies. The first step is to identify the target audience of your product. Before you started the product ideation process, you have identified your target audience on your research while understanding the market need. Therefore, you have the target audience defined already. The second step is to select the type of product testing according to your product and your objective. Most of the traditional market research companies use CLT, where they call a person to come to a central location and test a product, then complete a survey. On the other hand, on IHUT, the company sends the prototypes to the audience, and audience shares her observations on his home, without any distractions or pressure. CLT comes with some benefits — where tests are getting conducted with an observation of a moderator; which enables brands to direct the research according to the consumer behavior. If your product is a hygiene product or takes time to consume/use (product testing for a shampoo prototype might take 7-days long consumption cycle) IHUT is a better option for the research. For non-durables and most of the durable products, IHUT is more comfortable for consumers and provides more accurate insights to companies since consumers are consuming/using products on where they were supposed to consume/use them. 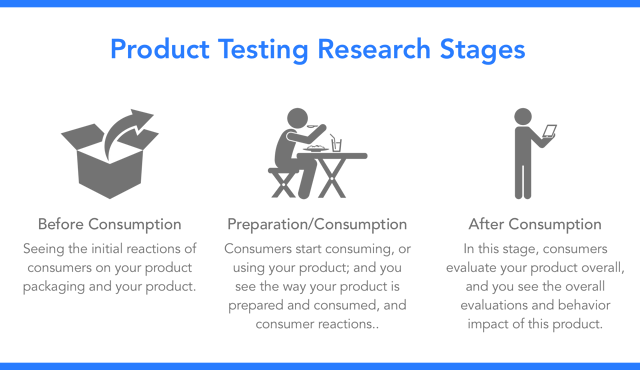 The third step to be ready for the research is defining the objective. Before proceeding, defining the objective is critical since it affects the research questionnaire. There might be several reasons for you to consider conducting a product testing. Unachieved Product Goals: Your product has not met the expectations and may not hit the targets you have set. There might be something wrong with your product, but you do not know what it is; it might be the flavor, the package design, product name, or something else. Poor Customer Feedbacks: Your customers had bad experiences with your product on a specific feature, and shared these feedbacks with you. Even though the market growth continues, you still should consider these feedbacks to validate/invalidate the major ones to avoid the risk. New Product Development: You are developing a new product, and before the mass production, it is essential to test your product with your target audience to be sure that reactions are positive to the product, and there are no mistakes that have been made regarding taste, packaging, smell. 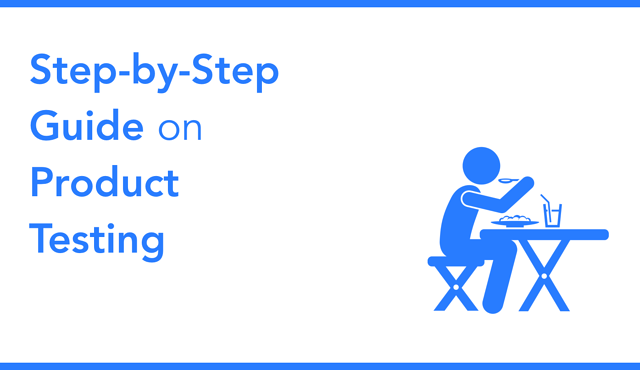 New Feature Development: You have a successful product and developing a new feature on it, so you before proceeding with direct implementation, product testing will allow you to understand how do your customers react to this new feature. Now your audience is specified, your objective is set, and you have selected one of the research types. General anatomy of a product testing study includes three stages, which are before consumption, consumption, and after consumption. Before Consumption: In this stage, you observe the initial reactions of consumers on your product packaging and your product. At this step, you ask feedbacks of consumers on packaging design, the smell of the product, and the way the product looks. This is the first impression of your product, and as important as the other steps. Preparation/Consumption: In this stage, consumers start to prepare/consume, or use your product; which allows you to observe the way your product is prepared and consumed, and consumer reactions to taste, smell, and portion. This is the most critical part considering you will receive the most extensive product experience insights from this stage. After Consumption: In this stage, consumers evaluate your product overall, and you learn the overall evaluations and behavior impact this product would make on the participant’s shopper state. Considering the stage of your product, you can design your questionnaire. If you do not have a packaging design your product, you can disregard the questions on packaging design, and proceed with the first impression and product experience. If you only want to understand the change in the taste because of a new flavor, you can directly enter the research by jumping other variables. Conducting product testing studies is not difficult. However, it is essential and must be implemented carefully considering this research will affect the extent of success of your products. Therefore, it must be conducted solidly. Which research vendor to proceed with? We have mentioned the differences between IHUT and CLT methodologies. If your product’s category or production stage requires you to conduct a CLT research, then you should proceed with traditional market research companies. Building laboratories for research is not a cheap investment, and these companies have much experience in that area. Using Twentify’s product testing solution, you can make your target audience to use/consume your product, learn their thoughts about the product packaging, taste and smell, see which steps they are going through when they are preparing; which allows you to understand the needed development areas within your product. If you want to conduct mobile product testing studies and learn more about how mobile market research works, go to www.twentify.com, and check our solutions and methodology. If you want to go further and learn more about the details, send us a message.